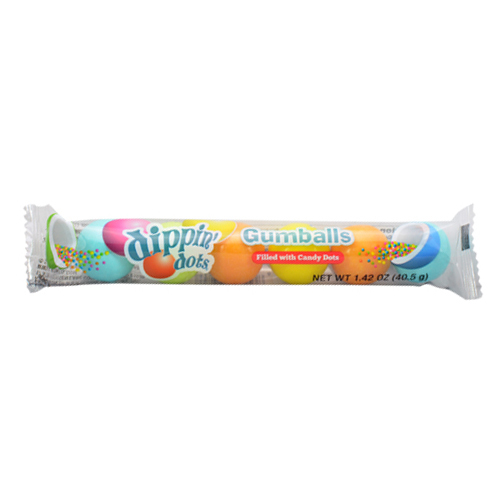 Six count sleeve of Dippin' Dots® logo-printed gumballs with filled center - Bite it open to reveal the candy beads inside! Assorted flavors of Dippin' Dots® popular Rainbow Ice treat: Strawberry, Blue Raspberry, Orange, Lemon, and Lime. 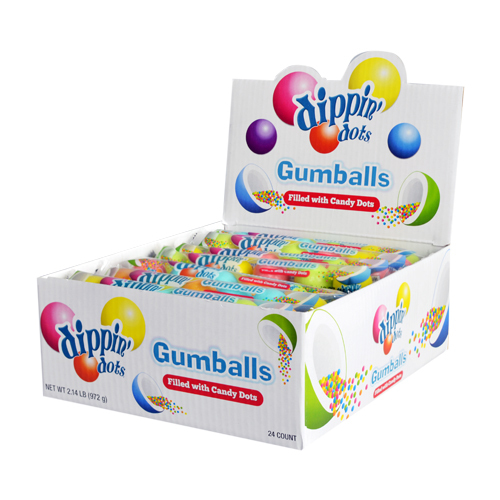 INGREDIENTS: SUGAR, DEXTROSE, GUM BASE, GLUCOSE SYRUP, ARTIFICIAL FLAVORS, GLYCERIN, MODIFIED STARCH, ARABIC GUM, ARTIFICIAL COLORS ( YELLOW 5, YELLOW 5 LAKE, YELLOW 6, RED 3, RED 40, RED 40 LAKE, BLUE 1, BLUE 1 LAKE), TITANIUM DIOXIDE, CARNAUBA WAX, CONFECTIONER’S GLAZE, BHT(TO MAINTAIN FRESHNESS). ALLERGENS: YELLOW 5, YELLOW 5 LAKE. Dippin’ Dots is a registered trademark of Dippin’ Dots, LLC. © 2018 Dippin’ Dots, LLC. All rights reserved.